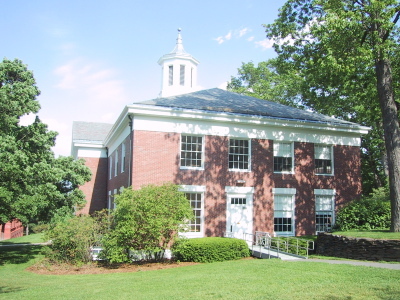 Edward Whitman Chapin Hall was built in 1958, with money given to the College by Miss Clara Chapin of Holyoke in memory of her father, a member of the Amherst class of 1863. The building was designed by James Kellum Smith '15 of the firm of McKim, Mead, and White, and dedicated October 31, 1958. The chapel inside is the Arthur Beebe Chapin Chapel, named for Edward's son, a member of the class of 1891. (Archives & Special Collections, Buildings and Grounds Collection, box 3, folder 3). (Photo taken 1 June 2002). 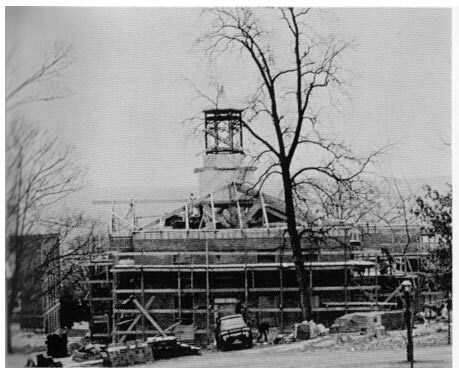 The construction of Chapin Hall, as pictured in the 1958 Olio (9).